Dr. Vishal Gupta is known for his work as Dentist in Laxmi Nagar, Delhi. He has been a practicing Dentist for 3 years. He studied and completed his study in B.D.S. from Harsarn Dass Dental College, Ghaziabad in 2015, Certificate Course in Advanced Oral Implantology by ICOI - IMPLADENT, INSTITUTE of Dental EXCELLENCE in 2015. He has hold his professional membership of International Congress of Oral Implantologists (ICOI), Dental Council of India and TOBACCO INTERVENTION INITIATIVE. The doctor offers services like: Root Canal Treatment, Teeth Cleaning Procedure, Teeth Whitening Procedure, Dental Fillings, Chronic Skin Allergy Treatment, Tooth Extraction Procedure, Dental Implants, Dental Extractions Procedure, Laser Treatment. He is currently practising at Jeevan multispeciality dental clinic in Laxmi Nagar, Delhi. Save your time and book an appointment online with Dr. Vishal Gupta on Lybrate.com. 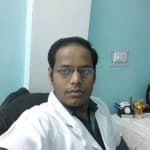 Lybrate.com has a number of high and qualified Dentists in India. You will find Dentists with more than 27 years of experience on Lybrate.com. Find the best Dentists online in Delhi. View the profile of medical specialists and their reviews from other patients to make an informed decision. Dr. Vishal Gupta is a renowned Dentist in Laxmi Nagar, Delhi. He has been a practicing Dentist for 4 years. He studied and completed B.D.S., Certificate Course in Advanced Oral Implantology by ICOI . He is currently practising at Jeevan multispeciality dental clinic in Laxmi Nagar, Delhi. Save your time and book an appointment online with Dr. Vishal Gupta on Lybrate.com. Lybrate.com has a number of highly qualified Dentists in India. You will find Dentists with more than 34 years of experience on Lybrate.com. Find the best Dentists online in Delhi. View the profile of medical specialists and their reviews from other patients to make an informed decision. Visited For Scaling: I went to see Dr. Vishal for a general checkup and on routine examination he suggested full mouth scaling after every six months for maintaining a healthy dentition. He was quite generous in explaining the need for this procedure and also described the correct brushing technique to prevent any further oral and dental disease. I underwent the whole procedure within thirty minutes without any pain or bleeding.The dentist was very elaborate about the post treatment maintenance. I am happy with this whole experience and would visit again after 6 months for routine check up. Only I could say that my fear of visiting dentist gone, all thanks to Dr Vishal ji for fabulous treatment without pain. Teeth is an important part of our body. Healthy teeth and oral hygiene give you a healthy body. Whatever you eat first come in contact with your teeth and gums. So if they are not clean and germs free. Whatever hygiene you maintained during cooking food goes in vain. So regular checkup and early treatment of your teeth will keep you away from many disease ad pain. A regular checkup even cost you less than a movie ticket. So brush daily especially before bedtime.